Infiltration and spread along tissue planes - sometimes for great distances. To distant sites such as lung, bone and bone marrow (occurs in about 10-20% of patients at presentation). The primaries are usually in the extremities, trunk or retroperitoneum. Bone metastases are often seen in the small bones of the hands and feet. Parameningeal tumors can be associated with meningeal thickening and spread via CSF pathways. 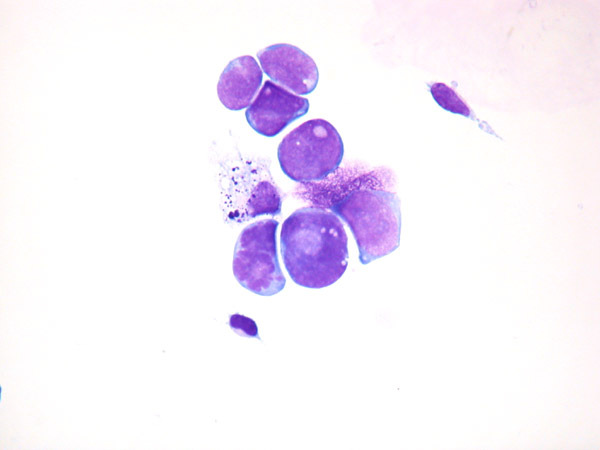 CSF Cytology: Below are small round blue tumor cells found in the CSF of a patient with leptomeningeal disease from rhabdomyosarcoma.